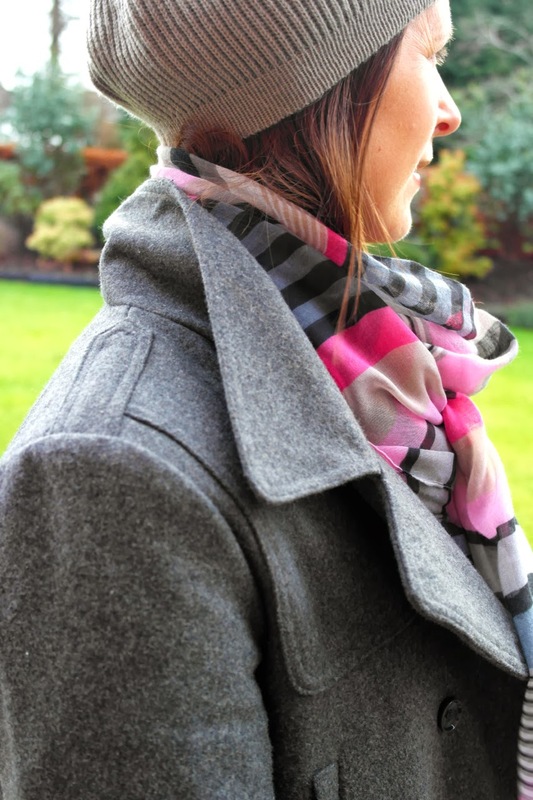 I've a few things to show you on the blog today...first up, I'm wearing a hat. Purely to cover the grey as it's been 9 weeks since my last colour. I'm booked in for the 3rd February so you can be sure of a few hats between now and then - oh and copious amounts of Colour Wow! Secondly, my coat. It's wool and it's grey (which you know I love) and it was reduced to £10! Bargain. But where, I hear you ask? Well, in the boy's/boys' (where DOES that apostrophe go??) department of Dunnes Stores...size 32-34" chest. Which (thanks to years of working in Penney's (Primark) kids-wear many moons ago), is the last size before a men's Small - so fits a boy around age 13-15. I actually looked at it for my son originally and then decided it was too big...but then took a notion to hide at the very back of the store and try it on - as it could look a bit weird to see a grown woman trying on children's clothes, no? Anyway, it was purchased on the basis that if I tire of it in a couple of years, my son can have it. It's another one of those win/wins = no brainer. Lastly, the scarf. My absolute favourite of all the samples I ordered last week and I will share some of them with you all very soon as I would love your opinions. Where did I take this outfit today? On a trip to Moira to my favourite haunt - The Fat Gherkin, where I met Emma from Adventures of an Unfit Mother...who lived up to her name because we were so deep in conversation, she forgot to pick up her son from nursery! But all's well that ends well. She wasn't *too* late...and it just meant we had to make another date to continue the conversation very soon. I should say, if you're looking for a fabulously written blog, I can't recommend Emma's enough. Twice winner of a MAD Blog Award, her regular posts brighten up my week immensely and not just because I know her but because she has a true gift for writing. There's a book in this woman and I want to read it. BRILLIANT coat - I must remember to shop in the children's section more! No VAT means lower prices! I love colours in your scarf! love the colour mix in the scarf - really nice ! Trying on my Boden Delivery! Parka & Pink and a Blogger meet-up! New Business Cards from Print Print! Testing My Waterproof Leather Boots!